My second cousin once removed, Enriqueta “Quetita” Dávila, is the daughter of José María Dávila (1897-?) and Enriqueta “Queta” Goldbaum (1900-?). I have written previously about her mother, who is my first cousin twice removed. I discovered this delightful article by Rafael Benabib about Quetita in the August 16, 2009 issue of El Diaro de Morelos of Cuernavaca. Below is my attempt to translate it — with plenty of help from Google Translate. A woman full of contagious joy, whose actions in favor of culture, as in the Jardin Borda celebration Day of the Dead (Miquiixtli), organizing the first carnival in Cuernavaca, getting the “Starters Cervantinos” for the first time and other shows for Cuernavaca, is Enriqueta Dávila Goldbaum, “La Baby Dávila,” a very important part of the city. La Baby Davila, because of the diplomatic work of her father, was born in San Diego, California and arrived in Mexico at a young age. She studied at the Colegio Franco Español. The Baby Dávila speaks 4 languages: Portuguese, English, French and of course Spanish. Her father, José María Dávila was a cadet at the Military College with the rank of captain before the Revolution, Mexico’s Ambassador to Brazil, he served as First Consul in Toronto and Ambassador of Mexico to the Canadian government. He also served as Ambassador to Guatemala. In politics he was a federal deputy, a Senator and Governor of the State of Sinaloa. Don José María “Chema” Dávila owned the Teatro de los Insurgentes in México City. As a child she spent every weekend at the family’s house in Cuernavaca until 1955, when the city became the permanent family residence. On her arrival she made great friends, such as Malena Rivera, Maruca Atala, Professor Maria Elena Ruiz and Patricia Riva Palacio. With them, she organized activities to benefit the Red Cross and other social service organizations. Everyone called her “La Generala Goldbaum” for her impetuous and strong leadership. Along with her friends she organized the Day of the Dead ceremony and managed to create the first Festival of the Flower, with the help of Mr. Leopoldo Cuata of the Association of Nurseries of Morelos, who provided almost everything needed for what it was: a successful exhibition of plants and flowers. She organized the first Carneval of Cuernavaca. She managed to get several floats parading through the city, simulating flying saucers, Chinese features and costumes, sports cars and many others. She appointed a Queen and King of the Carneval, ending on Shrove Tuesday with a dance in the center of the Plaza de Armas. For all these activities, La Baby Dávila got the help of engineer Don Marcos Manuel Suárez, the maestros of the IRBAC, the painter Monroy, Maestro Jacobo, Maria Elena Ruiz, Rafael Mazón, also a painter, architect Felipe Jardel and other personalities. Prizes will be awarded to the best costumes and floats. The gifts of silver trophies are from Antonio Castillo’s silver business in Taxco, Guerrero. La Baby was commissioned to bring to Cuernavaca the “Starters Cervantinos,” a ballet of Amalia Hernández of the Ballet Folklorico of the USSR and other shows I do not remember. One time her father’s friend, the muralist Don Diego Rivera, was visiting his home and asked Don Chema if he wanted him to do a painting of his beautiful daughter. La Baby blushed, and after several days of sitting before a Master in his study, he gave him a beautiful full body portrait, which the proud Don Chema displayed in his living room. Every day at five o’clock the gardener came, and one day he opened the door and a huge box was found lying in the garage. He went to scold La Baby for being careless careless, and heard the thieves jumped the fence to steal the painting, but fled upon hearing the gardener open the door. The work was sold immediately and today the picture is being exhibited at the Engineers Club of Mexico City, while The Baby has a copy at her home in Cuernavaca. The Baby Davila married the famous lawyer Bernabé Jurado after that she was married to Miguel Onaindia, father of her three children: Iñaki, Iker and Manuel, then she married Don Angel Cházaro and several others who she said she did not wish to remember. Today, Enriqueta Davila Goldbaum, at age 82, has not lost her energy, her agility of body and mind or her beauty. Her passion is reading and long walks for exercise and entertainment. When asked if she is now retired, she answers that would be like retiring from life. La Baby has always been a lover of Cuernavaca. Enriqueta Dávila is my second cousin once removed. I certainly am impressed by her energetic outlook in life..still exercising after all these years. Probably if I were in her shoes I’d be sitting inside a conservatory and relaxing. Wish her more years to come. The life of Enriqueta Davila Goldbaum is very interesting. I am quite intrigued by the part where it says she married more than once. 🙂 Her passion for reading books and going for long walks exercised her mind and body. I wish I can grow to be as old as her. 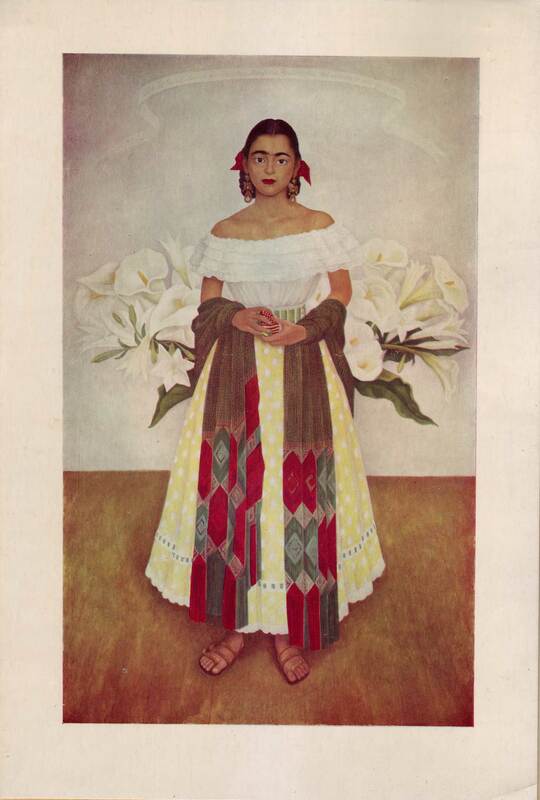 Although the painting by Diego Rivera is lovely, it does not make justice to La Baby, who I think was ona of the most beautiful women i have ever met. I have two 8″ by 12″ of the exact photograph above in my possession. I just can’t tell if they are lithographs or actual paintings dated 1948. Who could verify their originality for me? They were gifts from a very prominient woman in the Santa Clara County Valleywho at the time was already in her late seventies (over 25 yrs ago). She brought them from Mexico. I found a website that offers very similiar paintings of Enriqueta Davila, for hundreds of dollars – it appears to be a European Studio. It offers the exact portrait published above in this article, but interestingly enough – there’s is dated 1949. I have two – can’t tell what exactly they are; lithographs?, paintings with the name Enriqueta Davila -Onainda that is dated 1948. How can I find determine their authenticity? I grew up going to the Insurgentes theater and my uncle Chema was a witness in my wedding, he was my favourite uncle as well as his wife my aunt Enriqueta Goldbaum de Davila. I grew up going to the Insurgentes theater Jose Maria “Chema” Davila was my grandfathers brother…..